Cherry eye in dogs is fairly common, and although it's not a serious condition it is odd looking and uncomfortable for Fido. 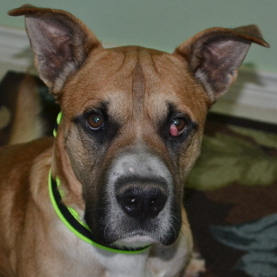 The classic symptom of cherry eye is a swollen, red lump at the inner corner of a dog's eye. As you can see, Ivan had a pretty big 'cherry' in his left eye, once I brought him home, our first road trip was to my vet! 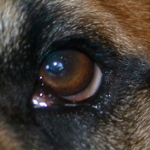 To learn all about the causes and treatment of this problem, you can check out my 'Does Your Dog Have Cherry Eye?' 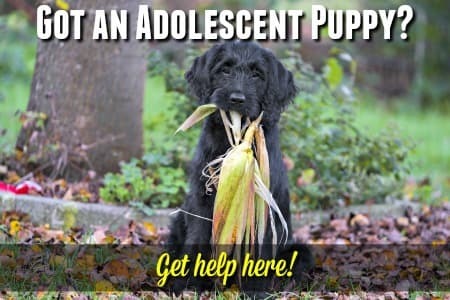 page... but don't forget to come back here to read all about one dog's personal experience with this condition.... and see the before-and-after photos! After taking a good look at his eye, she determined that his cherry eye had been there for quite some time (possibly even a year or more). We figure Ivan is somewhere between 3 and 4 years old, and he may have had this since he was a pup. The swelling was large, and quite dry. Not a good candidate for the less invasive, surgical option (which is tacking the gland back into place). So, I made an appointment for him to have the gland/eyelid removed the following week. I dropped Ivan at the veterinarian's office at 7am and filled out all the paperwork. Paid an extra $85 to have his blood drawn and tested for liver problems, clotting problems, blood sugar levels and a host of other things. This helps make sure that your dog is fit for surgery and that there are no unexpected surprises on the operating table. Then I drove back home second-guessing myself the whole way! Should I have insisted they try the less-invasive option first? Will he have a reaction to the anesthetic? Will he be in a lot of pain? Yadda, yadda, yadda.. you know, motherly worries! At 12:00 noon the vet's office called me to say that Ivan had 'done great' with the surgery and would be ready to come home anytime after 4pm. Whew! I breathed more easily for the first time all day. At around 5pm I arrived to pick up Ivan, and was greeted by a very happy and active dog, who was wiggling and waggling his back end all over the office. It was a little red and the tissue at the inner corner was a little swollen, but compared to the cherry he'd been suffering for so long it was amazing. Once out of the office, Ivan slept like a log all the way home (the result of the painkilling shot he had been given earlier that afternoon), and was pretty quiet, but his normal happy self, all evening. He didn't seem to be in any pain at all though, which was a big relief for me. Even though he didn't seem to be hurting, that night before bed, I gave Ivan the dose of painkiller that the vet had given me as per instructions, and he went out like a light! In hindsight, this was probably a mistake because... this kind of sleep is so deep that my poor boy woke me up at 3am because he was peeing uncontrollably! He's fully house-trained, but the narcotic effect of the medication must have deadened all his nerves and sedated him so deeply that he had apparent woken up in a puddle (no, make that a lake) of urine and then wandered over to wake me up, peeing all the time. It was a mess. He hadn't had much to drink that day, but I'm guessing he IV fluids - and a lot of them. I wasn't upset with him at all, but made a note to myself.. after surgery, do not give pain meds unless pet actually seems to be in pain! The shot he had been given after the surgery would probably have been more than enough. Other than that small hiccup, my adorable boy was back to normal right away. On the day after his surgery he ate, drank, played and fooled around as though nothing had happened. I had to put an antibacterial eye-ointment in the affected eye twice a day for seven days, but that's all. The stitches were the kind that dissolve, so no need for a second vet trip to have them removed. The white of his eye remains a little pinker, and the lower lid is a little lower, than on his right eye, but other than that he looks wonderful and is totally unconcerned by his whole experience. At this point, my veterinarian is not recommending eye drops to lubricate Ivan's eye as everything seems to be working fine, with no problems. BUT, I will need to watch him closely in the future, and if at any time there are signs of irritation, inflammation or discharge he'll need to be examined right away. As he ages, this will become even more important and I'll probably use eye-drops proactively at that point - just to be safe. An update on Ivan's post-cherry-eye journey and I'm happy to report that his eye is still perfect and he's had no issues with dry eye or any other potential side effect of his surgery. At this point I still see no need for eye drops, now or in the near future, perhaps he may never need them. Woo hoo! Obviously this is a 'story of one' and our experience is unique to us, but for anyone who might be considering the gland-removal surgery for cherry eye I hope Ivan's experience gives your hope and peace of mind. This was not a horrendously expensive surgery (several of our family dogs have needed much more costly procedures for one thing or another), but it wasn't really cheap either. 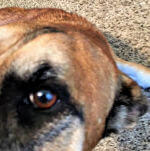 Depending on where you live, the size of your dog, your veterinarian's pricing structure, and whether or not you elect to have the pre-op bloodwork done, and whether you need to take home medication, the average cost of dog cherry eye surgery is somewhere around $350 - $450 (per eye). Obviously you could pay less than this if you don't do the blood-testing - and if Fido has had a thorough physical recently, or had blood work done for an earlier surgery or investigation you might not need it. That testing is optional, and the vet can tell you if your dog is high-risk or low-risk, but there are no guarantees (even with the testing done), but I figured it was worth the extra $$$'s to give him that extra 'edge'. From feedback that I've received from visitors to this page, it would seem that in many states the costs are higher than the ones featured here. I live in a rural area in a state with a low cost of living. If you live in an urban area or a part of the country where costs are generally higher then veterinary care will be priced accordingly. 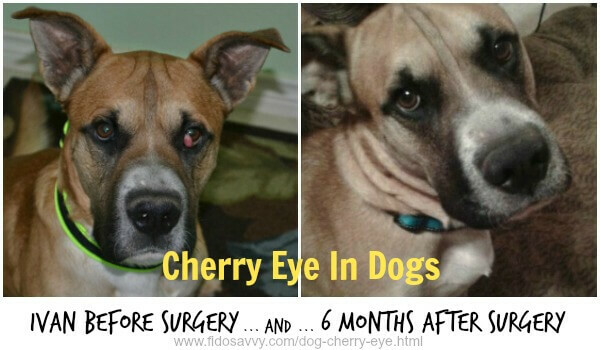 The Ultimate Before-and-After Dog Cherry Eye Photos! 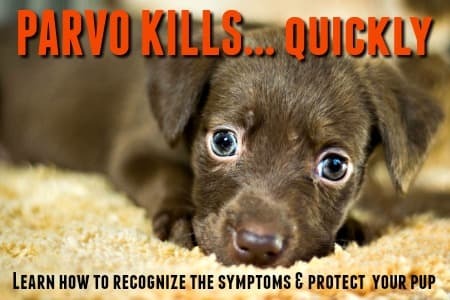 So, I hope this has helped you if you're worried about your dog. I wish you lots of luck and hope that he (or she, of course) is looking and feeling as good as Ivan does, really soon. I recently received an email from a visitor to this page who found the information on this page helpful when she was deciding how to treat her dog's cherry eye. 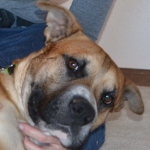 'I enjoyed reading your post on Ivan's cherry eye surgery. It was informative and helped me decide to go ahead with surgery for my dog, Rainah (10 month old Rottweiler). She had her 3rd eyelid removed today. Other than a little swelling, her eye looks normal. Total cost was $150. I had purchased eyedrops a few weeks ago for $40 and will use those for 7-10 days post op. She's acting perfectly normal this evening, running, playing, etc. I want to thank Melissa for sharing Rainah's experience and for giving me permission to share what she wrote here. I hope it will give other dog owners in a similar position hope and confidence.